for details of prescription drug abuse – which cause the largest percentage of deaths from drug overdosing (Over 22,000 a year). A Judicial Review Judgement handed down today in the Royal Courts of Justice has halted Government plans to increase legal costs for the victims of the asbestos related cancer mesothelioma. This is an extremely aggressive disease usually affecting the pleura around the lungs, life expectancy after diagnosis is approximately nine months and the only known cause in this country is exposure to asbestos. In his judgement the Honourable Mr Justice William Davis ruled that according to the Government’s own Legal Aid Sentencing and Punishment of Offenders Act of 2012 (LASPO) a review had to be carried out into the likely consequences of such plans before they could be implemented. Commenting on the ‘review’ the Government did undertake he concluded that “no reasonable Lord Chancellor, faced with the duty imposed on him by Section 48 of the Act, would have considered that the exercise in fact fulfilled that duty”. He has called on the Lord Chancellor to carry out a proper review. Until this review is concluded the Government cannot implement the changes. Asbestos Victims Support Groups have welcomed this judgement. Tony Whitston, Chair of the UK wide Forum of Asbestos Support Groups, called on the Government to “see this judgement as an opportunity to take a new approach based on justice for victims of big financial institutions. The old plans were rooted in a culture of secret deals with insurers and flawed consultations which excluded the victims of asbestos. Now is the time for a change”. This judgement is only the latest in a series of developments which have undermined the Government’s case. 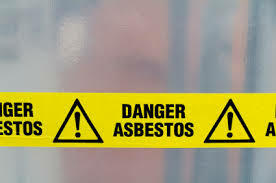 During the process of taking the Judicial Review the Asbestos Support Groups discovered that the Government had signed a secret Heads of Agreement with the Association of British Insurers concerning the reform of mesothelioma claims in July 2012. The secret agreement contained all of the measures the Government would include in a 2013 consultation paper on reforming mesothelioma claims, including the commitment to increase the legal costs for sufferers in mesothelioma cases. Shortly after this revelation the Government’s plans came under further attack when the Parliamentary Justice Select Committee published a damning report into the conduct of the review required before the changes could be brought in. They concluded that the review was “maladroit and “unsatisfactory” and called on the Government to start again. The origins of the Government’s situation lie in the Legal Aid Sentencing and Punishment of Offenders Act 2012 (LASPO). Sections 44 and 46 of this Act impose legal costs on people taking personal injury cases. ‘During the passage of the Act, the Lords, in an act of humanity, insisted that dying mesothelioma sufferers be exempt from legal costs. The Government grudgingly allowed a temporary exemption pending a review of the likely effects of legal costs on mesothelioma claims. The Government carried out this review in 2013, largely as part of a consultation into a wider raft of measures aimed at reforming the mesothelioma claims process. Asbestos Support Groups have always maintained that the review was deeply flawed. In light of the Justice Select Committee report and today’s ruling that case appears unanswerable. The Legal Aid Sentencing and Punishment of Offenders Act 2012 (LASPO) came into effect on 1 April 2013. On the House of Lords insistence the Government introduced S48 LASPO which prevents LASPO section 44 (payment of success fees) and section 46 (after the event insurance) from coming into effect for mesothelioma claims until a review has been conducted into the likely effects of s 44 and 46 on mesothelioma claims and a report of that review is published. The review was incorporated into a consultation on reforms to mesothelioma claims 25 July 2013 ending October 2013. The reforms, including a mesothelioma pre-action protocol, formed part of a secret agreement with the Government. On the 4 December 2013 the Justice Minister Shailesh Vara confirmed that the Government had decided to end the mesothelioma exemption. Scroll down for replies given by Ministers on July 29th and July 3oth 2014. It is a pleasure and a privilege to join you in Manchester on Action Mesothelioma Day – to stand with you in Albert Square, and to watch the release of the doves as they flew above this beautiful Town Hall. You’ll forgive me if I begin by paying tribute to the late Labour Member of Parliament for Wythenshawe and Sale East, Paul Goggins, who was not only a parliamentary colleague but a man I counted as a dear friend. He was also a tireless supporter and champion of those affected by mesothelioma. You have heard moving tributes to him in Albert Square from North West parliamentary colleagues – not least from Andy Burnham MP, the Shadow Health Secretary. For Paul’s family and his friends his death at Christmas last came as a shock and a terrible loss. Perhaps it is a small link to the families gathered here today, also mourning the loss of loved ones, and whose presence, like that of Paul’s colleagues, and especially his successor, Michael Kane, ensures that the baton passes to new hands and that loss is channelled into positive actions. Let me also say, in parenthesis, that without the work of Tony Whitston, and others in your support groups, we in both Houses of Parliament would not have had the battery of arguments and case studies which we have been able to deploy. Many of you have written to me, and your profoundly moving stories have made a great impact on me and on many of my Parliamentary colleagues. 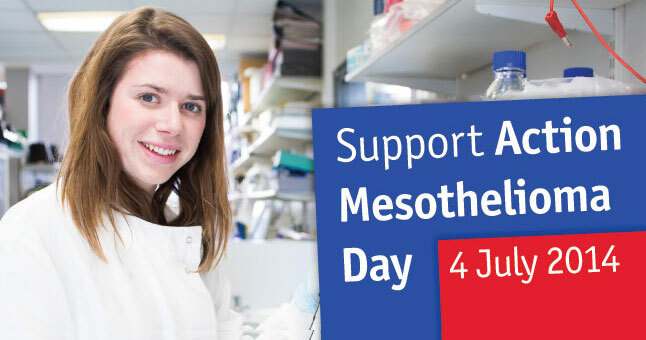 As the Chair has rightly said, your presence today is a vivid reminder to all politicians that much still needs to be done to help mesothelioma sufferers – most of all to provide funding for mesothelioma research. Andy Burnham MP – – the Shadow Health Secretary. 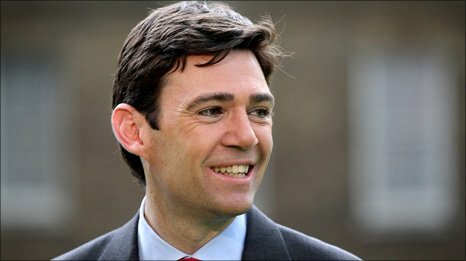 Perhaps the most important thing we have heard today is the pledge given by Andy Burnham that should he be Health Secretary in an incoming Labour Government he would ensure that the insurance industry is required to support mandatory research to develop cures for mesothelioma and that an incoming Government would match that support. That is as welcome as it is important. I think it is also important to say first why I, and many other parliamentarians, are so concerned about those who suffer from mesothelioma. While I served in the House of Commons for a Liverpool constituency I met far too many grieving relatives who had lost loved ones to this disease. Mesothelioma is an occupationally-related disease. Simply put, men and women went to work and they were negligently exposed to asbestos when it was known that asbestos caused great harm. In 1965, the Newhouse Thompson report provided shocking evidence that a brief exposure to asbestos could result in mesothelioma fifty five years after first exposure. Yet, scandalously, and with utter contempt for life and health, men and women continued to be exposed to asbestos with little or no protection for decades after the Report was made public. Nearly 40,000 people have died from mesothelioma from past exposure to asbestos, and some 56,000 will suffer from mesothelioma years to come. 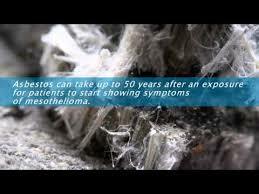 The UK has the highest incidence of mesothelioma world-wide. Society owes a great debt to those who went to work, often in hard, heavy industry, and built the economy of this country, only to suffer terrible consequences. That is why I, and others, would not accept the Government’s decision in Part 2 of the Legal Aid Sentencing and Punishment of Offenders Bill to make mesothelioma sufferers pay legal costs when they claimed compensation. I successfully moved an amendment in the House of Lords to exempt mesothelioma sufferers from paying legal costs, and when the Commons sent it back, the Lords voted for it again and our cross-party alliance defeated the Government for a second time and sent it back to the Commons. In the Commons, Paul Goggins MP led the debate, and together we secured an exemption for mesothelioma sufferers pending a review and a report on the likely effects of legal costs on mesothelioma claims. Regrettably, the Government have now published their report and intend to end the exemption. But that battle isn’t over yet. I recently wrote to the Justice Minister, Lord Faulks, saying that the review was premature and wholly inadequate. The Government will be challenged on its decision. Although we must continue to insist on proper and commensurate support for those families blighted by the curse of this disease, I have also been critical of the lamentable and paltry sums of money which have gone into finding the causes and cures for mesothelioma. So when, last year, the Government introduced the Mesothelioma Bill in the House of Lords to set up a payment scheme, funded by insurers, for mesothelioma sufferers who could not trace their insurers I determined that something must be done to secure funding for mesothelioma research. Because mesothelioma affects so many people, the insurance industry has had to pay compensation in thousands of cases, and must continue to do so for decades to come. Consequently, mesothelioma has become a battle ground as insurers try to reduce their liability to pay compensation. When the insurance industry won their legal battle to end compensation for the asbestos disease, pleural plaques, they saved millions of pounds. The Government did not reverse the legal decision and some insurers agreed to pay £3 million to help fund mesothelioma research – a very welcome gesture. The British Lung Foundation has responsibility for this research funding and has been doing a fantastic job supporting essential research, but that money has now been used up. The insurance industry could reduce their liability for compensation more successfully if, instead of court challenges, they continued to donate money to mesothelioma research. If better treatment and a cure could be found, they would pay far less in compensation. If all the employer liability insurers were to pay just a small amount to mesothelioma research each year that would make a huge difference, and, if the Government matched that funding, what a difference that would make! With that in mind, I moved an amendment to the Mesothelioma Bill in the House of Lords which would require every employer liability insurer to pay a small annual levy to fund mesothelioma research. During the debates on the Bill I received tremendous support from The British Lung Foundation and from many members of the Lords who are eminent physicians. • If successful the amendment would have a secured a sustainable and fair future funding system by charging a small levy on the 150 or so insurance firms active in the Employers’ Liability Insurance market, and a small contribution from each could raise a vital £1.5 million each year for mesothelioma research – small sums which would make a huge difference to the future of mesothelioma research in the UK, and could potentially lead to a cure which would save tens of thousands of lives. Indeed, it is true to say the Minister, Lord Freud, said he felt like adding his name to the amendment, but complained that he ‘had hit a brick wall at every turn’ when trying to find a way forward. To which I responded: “It is Parliament’s job to demolish such brick walls”. • Well, we did not demolish the brick wall, although we came within a whisper of doing so. • We lost by just seven votes. .
Kate Green, MP for Stretford and Urmston, led the Official Opposition in calling for mesothelioma research and Tracey Crouch MP and many of her Conservative colleagues broke ranks and called on the Minister to agree. 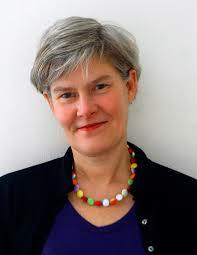 • In the Commons, Kate Green, MP for Stretford and Urmston, led the Official Opposition in calling for mesothelioma research and Tracey Crouch MP and many of her Conservative colleagues broke ranks and called on the Minister to agree. There is support for mesothelioma research across all parties and throughout the many constituencies affected by mesothelioma. 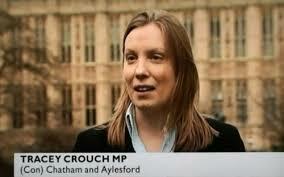 Tracey Crouch’s constituency of Chatham and Aylesbury has high levels of mesothelioma sufferers caused mainly by working on ships in Chatham dock yard which contained an enormous amount of asbestos. This horrible disease strikes all over our country and in every constituency and many walks of life. 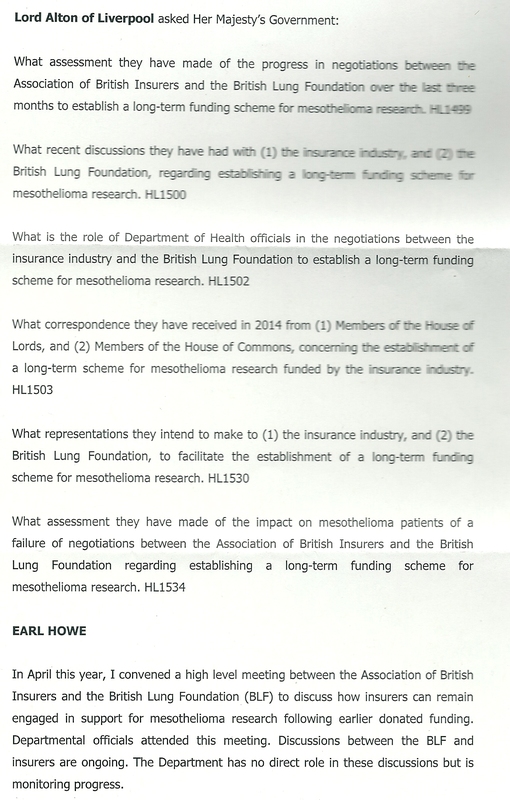 • In response to considerable and mounting political pressure the insurance industry wrote to the Minister on the day of my debate, pledging £250,000 to The British Lung Foundation and agreeing to come to the table to talk about long term funding options. This was a crucial step forward, but it was also a very easy token gesture for the industry to make. In a multi-billion pound industry, £250,000 is a drop in the ocean. Sadly, in terms of research funding, it does not go far either. At the time I was concerned that an agreement to discuss funding options is an awfully long way from an agreement to provide funding. And I’m disappointed to say that since then the industry has continued to stall at every turn. • Ministers have put considerable personal effort into looking to find ways to encourage voluntary funding from the insurance industry. This has included facilitating ongoing meetings and negotiations between the Association of British Insurers and The British Lung Foundation, yet whilst this is valued – it is not enough. The Government must now go one step further, and make a commitment to legislate in order to make this funding compulsory. First, the National Institute for Health Research were told to commission the James Lind Alliance to bring together patients, carers and clinicians to set priorities for research. That work has now been done and we await the report. 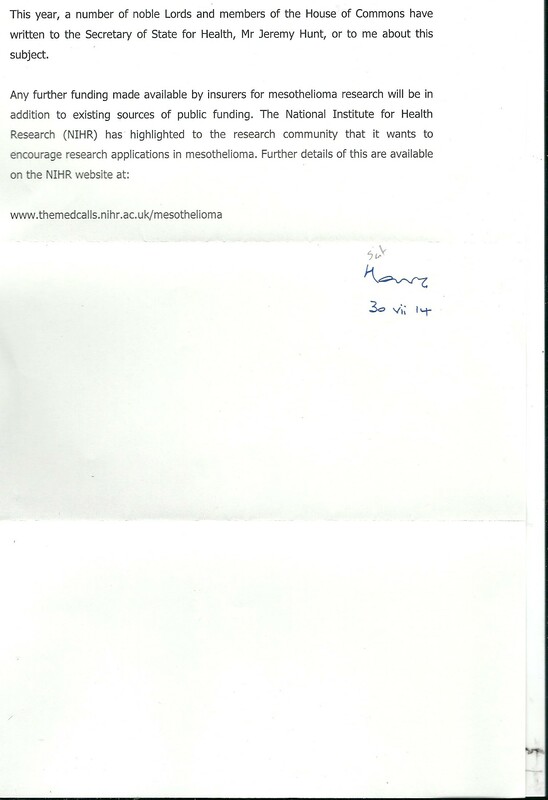 Secondly, the National Institute for Health Research were told to make mesothelioma research a priority area, by issuing a ‘highlight notice’ to the research community. Thirdly, the National Institute for Health Research were told to make available their research design service to help applicants develop good research proposals; and. Fourthly, the National Institute for Health Research, together with the Medical Research Council and Cancer Research UK, were told to bring together researchers to develop new research proposals. That has been done. Is it enough? NO. 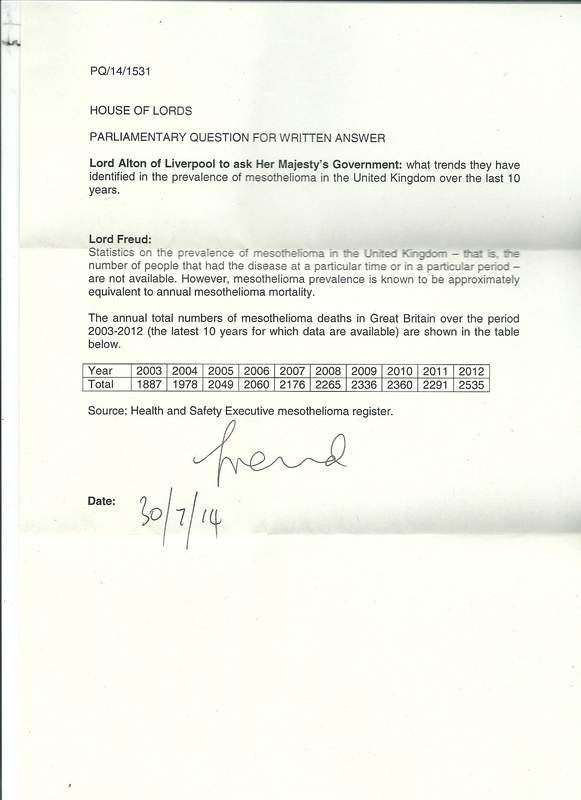 Earlier this year I put down a Private Members Bill for a levy on insurers for mesothelioma research. Initiatives to achieve this end go wider than Parliament. The British Lung Foundation is in active discussions with the insurance industry now about committing to long-term funding for mesothelioma research. The insurers are to give an answer soon, and we expect them to say YES. Let us be clear. We are not asking for the World. Just small sums from the insurance industry would make a huge difference to the future of mesothelioma research in the UK and could potentially lead to cures, saving tens of thousands of lives. There are an estimated 150 insurance firms: a small contribution from each could raise a vital £1.5 million each year for research. There is no reason in principle why an employers’ liability insurance levy should not be supported. We should remember that the employers’ insurers’ liability market is a captive market: i.e. insurers enjoy a guaranteed market because employers must, by law, take out employers’ liability insurance. Unfortunately, for decades, insurers neglected to keep employers’ liability insurance records so that hundreds of mesothelioma sufferers lost over £800 million pounds in compensation. This loss to mesothelioma sufferers was a windfall to insurers. A small levy on insurers now is hardly much to ask, especially as it is in their interest to support mesothelioma research. So what has been achieved so far in this campaign? There’s an old saying that the best time to plant a tree is twenty years ago; the second best time is now. Clearly, it would have been better if, twenty years ago, significant resources had been put into finding the cause and cures for mesothelioma but the second best time is now – – certainly not twenty years from now. • And we can take some comfort that over the last two years there has been growing political support for the need for the insurance industry to fund mesothelioma research. The Government’s duty to intervene to make this a reality has also been established. • New researchers from other areas of therapy have started taking an interest in mesothelioma, bringing with them new expertise and insights. Europe’s first mesothelioma tissue bank has been created to collect and store biological tissue from mesothelioma patients for use in research; and work is being funded to identify the genetic architecture of the disease. • However, as all the original funding has now been allocated and new funding is desperately needed to continue this vital work, it is imperative that we keep up the momentum of scientific discovery if we are to have any chance of finding a cure for this devastating disease. Not twenty years from now. The seriousness of the situation was revealed only yesterday when The Independent newspaper reported that fresh figures from the Health and Safety Executive showed a 10% increase in mesothelioma cases, due largely to a greater number of male deaths aged 65 and over. The British Lung Foundation say the numbers will continue to rise until 2020. The newspaper reported the demands of scientists and doctors for more money to be urgently pumped into research. • Although there is no doubt that the importance of mesothelioma research has been accepted in the highest quarters of Government and in the research community, and action is being taken to develop bids for important areas of research, I am gravely disappointed that as I stand here today, that we have still not received a long term funding commitment from either the Association of British Insurers or individual insurance companies. • The British Lung Foundation tells me that negotiations have all but come to a standstill. We had expected a definitive answer from the industry in June – sadly all we have had is a “will be discussed further in July”. • There is not long left of this Parliament for the Government to act. I believe we must do all we can, both as campaigners and parliamentarians, to put pressure on the Government to bring forward a legislative solution. • There is strong support for mesothelioma victims across the political spectrum – but we need to do even more to ensure that the Government listens. • I know that in the last couple of weeks The British Lung Foundation wrote to all parliamentarians urging them to write to the Minister, and so far nearly 20 MPs and peers have taken action – including the former head of the British Navy, Admiral Lord West, who has pledged his full support to the campaign. • The British Lung Foundation has put out an urgent call to arms to all of their supporters, urging them to write to their MP as a matter of urgency – I’d encourage everyone here to take the action if they have not done so already. We need to ensure that as many politicians as possible make representations to Ministers. The Government needs to understand that this issue will not go away until the insurers do their part towards tackling this horrendous disease. • For my part, I plan to re-table my Bill and I hope that a Member of the Commons will also table it there and, if we still have no resolution, I will help coordinate a cross party parliamentary delegation to appeal directly to the Minister in the autumn. • Until then, I will continue to work with colleagues across Parliament to remind the Government, day in and day out, of their duty to step in and stand up to the insurance industry, and to legally compel them to fund mesothelioma research if the industry will not fund it of their own accord. Today is about hope for the future born out of past suffering. Hope and compassion, yes, but it is also about justice. You who are gathered here today have understood what the poet, Philip Larkin, meant when he wrote that “We should be careful of each other while there is still time”. You have admirably demonstrated what it means to show care for one another. Your Action Mesothelioma Day appeals in Manchester, which have raised over £100,000 for mesothelioma research, and the efforts of the other asbestos support groups which have also engaged in tremendous fund raising efforts, have been a practical way of being careful for one another, showing compassion and focused generosity. In many respects you put the industry and Government to shame. 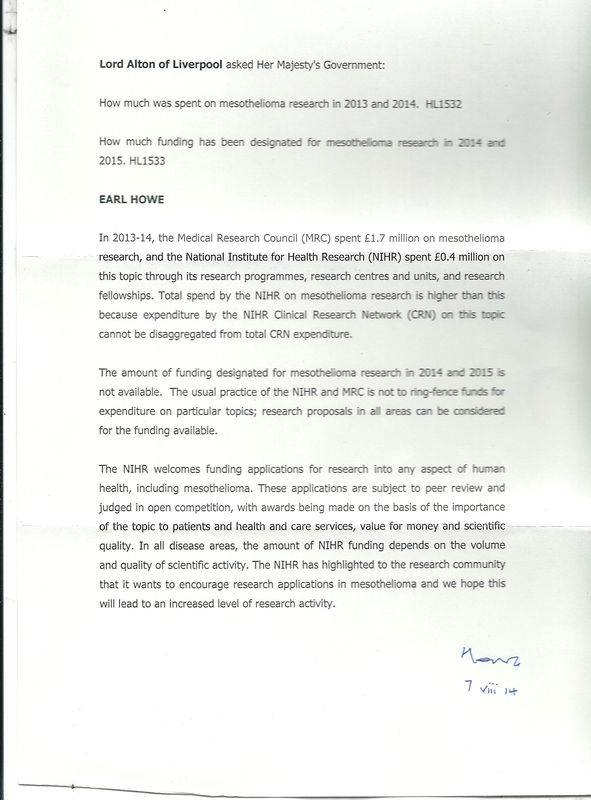 But, research funding cannot be left just to families affected by mesothelioma. Today, all of you have made a public call for much improved mesothelioma research funded by insurers with match funding from the Government. It is a call for justice. And you have been joined by all of the asbestos support groups in the UK who have sent out a rallying call to Pledge to Beat Mesothelioma which you have all signed up to. Today, I can say that I, and my Parliamentary colleagues, will continue to fight for funding for mesothelioma research. With your help, and with the help of all those who are joining together to promote ACTION on Action Mesothelioma Day throughout the UK, we will succeed. The Parliamentary Under-Secretary of State, Department for Work and Pensions (Lord Freud) (Con): Based on the latest data available the Health and Safety Executive estimate that there will be around 58,000 mesothelioma deaths in Great Britain over the 30-year period 2013-2042. The statistical model used suggests an uncertainty range of 53,000 to 64,000 deaths on that estimate. 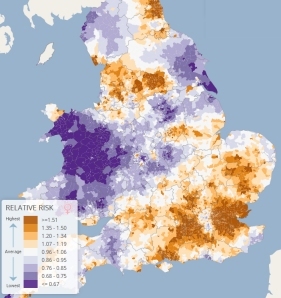 However, the true uncertainty range may be wider as longer-range predictions are reliant on assumptions about asbestos exposures that cannot currently be fully validated. 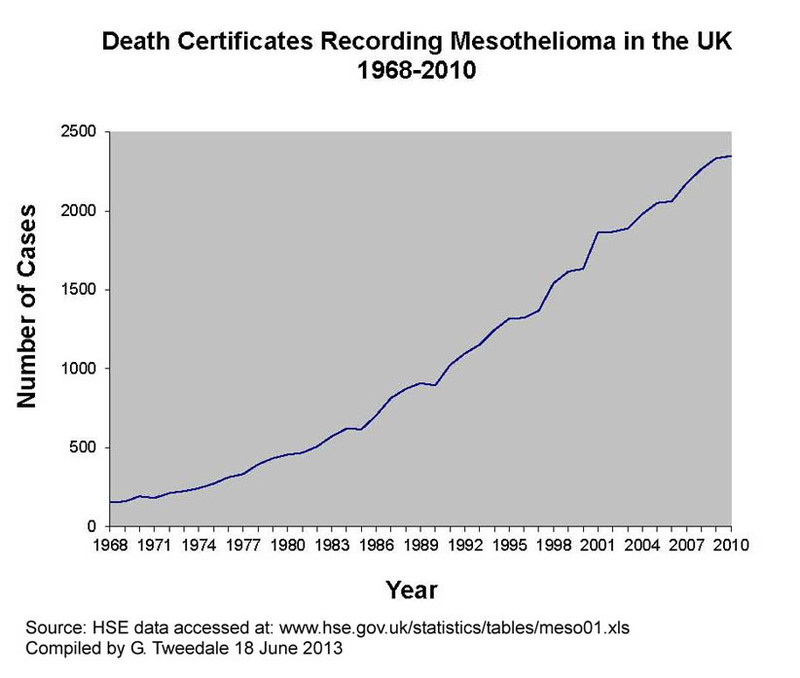 The annual number of mesothelioma deaths in Great Britain is projected to peak towards the end of this current decade. The Parliamentary Under-Secretary of State, Department of Health (Earl Howe) (Con): In April this year, I convened a high level meeting between the Association of British Insurers and the British Lung Foundation (BLF) to discuss how insurers can remain engaged in support for mesothelioma research following earlier donated funding. Departmental officials attended this meeting. Discussions between the BLF and insurers are ongoing. The Department has no direct role in these discussions but is monitoring progress. This year, a number of noble Lords and members of the House of Commons have written to the Secretary of State for Health, Mr Jeremy Hunt, or to me about this subject. The Parliamentary Under-Secretary of State, Department for Work and Pensions (Lord Freud) (Con): Statistics on the prevalence of mesothelioma in the United Kingdom – that is, the number of people that had the disease at a particular time or in a particular period – are not available. 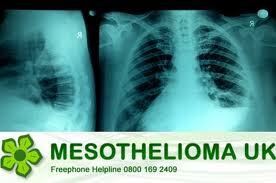 However, mesothelioma prevalence is known to be approximately equivalent to annual mesothelioma mortality. The annual total numbers of mesothelioma deaths in Great Britain over the period 2003-2012 (the latest 10 years for which data are available) are shown in the table below. 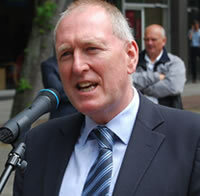 Source: Health and Safety Executive mesothelioma register.